Get The Industry Standard - in print and online! Wineries: Comprehensive listings of more than 10,000 wineries including addresses, phone/fax numbers, email addresses, websites, top winery personnel, vineyard acreage details, products made, top varietals produced, brand names, case production, custom crush information, AVA location, tasting room and wine club information. Instant online access available upon purchase of the Print Directory. 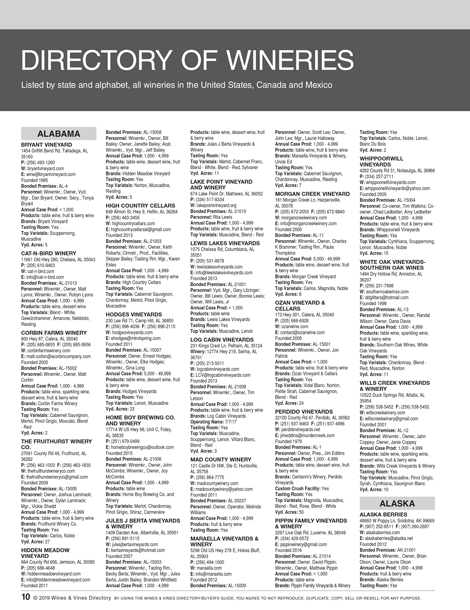 Growers: The current edition features more than 800 North American winegrape growers and their respective contact information, AVA areas, top varietals grown, acres planted and their winery clients. Featuring vineyards as well as wineries that grow and sell grapes. Distributors: Find more than 1,400 wine distributors listed by major metropolitan areas with their contact information and the wineries and brands they represent. Direct Shipping: Completely updated Direct Shipping Compliance Section, outlining the latest shipping laws and regulations in all 50 states. Buyer's Guide: Our category listings enable you to find-with ease and precision-exactly the product, service and company you are looking for. We've also added new brands, resellers and expanded contact information. Efficient Layout: Indexes to quickly find wineries that offer Custom Crush Facilities as well as wineries that grow and sell grapes. Wine Writers: Contact information as well as general information regarding more than 200 of the top wine writers in the wine industry. Winery and Brand Cross-Reference Guide: Complete cross-reference for 9,000 wineries and wine brands. Viticultural Areas of North America: The most current listing of AVA name, date established and total acreage, listed by state and region. US Grape Crop Authorities: Including contact information on grape crop experts and farm advisors. Government Agencies: Complete listings for TTB offices and Control Authorities for each state. University Programs: State-by-state listings of the top colleges and universities in viticulture and enology with course highlights and program information. Wine Competitions: State, Regional, National and International competition details. Next Generation and Flash Websites: A resource to assist wineries in sales and marketing, this section details websites that are wine based retailers with unique consumer appeal and wine centric social network sites.